Orange-on-seder-plate tale is flawed, feminist says – J. It all began when Susannah Heschel, a leading Jewish feminist scholar, was lecturing at a synagogue in Miami. As she spoke, an elderly rabbi stood up and declared, "A woman belongs on the bimah like an orange belongs on the seder plate." Thus to show support for the changing role of women in American Jewish society, the tradition of placing an orange on the seder plate began, and Heschel became a household name at many Passover celebrations around the globe. The only problem is, according to Heschel herself, the story isn't true. "What you hear is not what actually happened," she recently told a crowd at the Marin Jewish Community Center program on "Women who Shook the Jewish World." "It's been circulating for a long time and it's become a bit of an urban legend." Heschel was visiting a college in the Northeast where she learned that some of the students had started placing crusts of bread on their seder plates as a way to express the exclusion of women and homosexuals from Judaism. Heschel thought this was great. But since it violated the Passover dietary restrictions, she decided to modify the act, placing an orange on the plate instead of the bread crust to represent both women and homosexuals. "The first year I used a tangerine," the mother of two revealed to the packed room of mostly women and some men. "Everyone at the seder got a section of it and as we ate it we would spit out the seeds in solidarity with homosexuals — the seeds represented homophobia." Heschel, chair of the Jewish studies program at Dartmouth College, said she was "horrified" at first by the way the story of the orange metamorphosed. One, "they took my idea and put it into a man's mouth." Two, "they erased the whole idea of the homophobia that needs to be spit out." On the whole, Heschel is proud of the way women's roles have evolved within Judaism and in the Passover seder. While "American Jews always get a raw deal" because of their reputation for assimilation and intermarriage, "we also created the Jewish feminist movement and exported it to Israel, Europe — wherever Jews exist." But it wasn't always like this, even during Heschel's lifetime. "When I look back at what used to be," she said, "I would never have suspected what is today." The daughter of the late Rabbi Abraham Heschel, a prominent Jewish scholar and civil rights leader, faced plenty of discrimination in her own life. When she was 12, for instance, she wanted what most girls rarely had — a bat mitzvah. When she asked her rabbi if she could have one, he said no and told her he'd throw her a party and bake her a chocolate cake instead. Later when she asked another spiritual leader why women could not make an aliyah at the Torah, "He laughed and said: 'Because everyone in the congregation would look at her legs.'" The final straw was on Simchat Torah when Heschel attended synagogue with a male friend. The other men swept him into a circle of dancing with the Torah, leaving Heschel on the side to watch. "It was my idea to go," she said angrily. "He wanted to go to the movies!" Heschel couldn't take it. She walked into the circle and started dancing. Then one man scolded: "Who gave you permission?" "And he said: 'Get out of here!'" Heschel felt this was wrong. That "as much as men wanted women behind a curtain, God didn't." Like many women, Heschel stuck with Judaism because she loves it so much. Just as the agunot, who are not free to remarry by Jewish law, yet don't abandon the faith, she also feels "chained to the Torah, tied to Judaism in a way that's very deep and profound." But for the longest time, "I felt so alone. So many women have stood alone. It has taken awhile for us to feel a sense of community." And still, all isn't perfect. "The old roles of women are maintained under the guise of liberal Judaism," she noted. "We're still marginalized even though we have supposed equality." In fact, she said, Orthodox women are less likely than Reform women to feel like an underclass. "They say it's not sexist but liberating for them. They feel honored and respected." Perhaps that is because "in Orthodoxy the mechitzah [the curtain or divider separating the sexes] is recognized," while "in Reform Judaism, there is still a mechitzah," which no one talks about. "It's an invisible mechitzah," she said. "It's a feminist's work to unmask and expose this." Partially to blame is what she called a hierarchical image of God as a king: transcendent, all-powerful, all-knowing. A feminist God, on the other hand, would be "passionate, with feeling and emotion. Heschel, who has edited and contributed to numerous publications on Jewish feminism as well as works on her father, said, "You can include matriarchs in prayer, you can change Jewish law, but you can't change the image of God." I went to a BDS seder. Someone brought settlement wine. 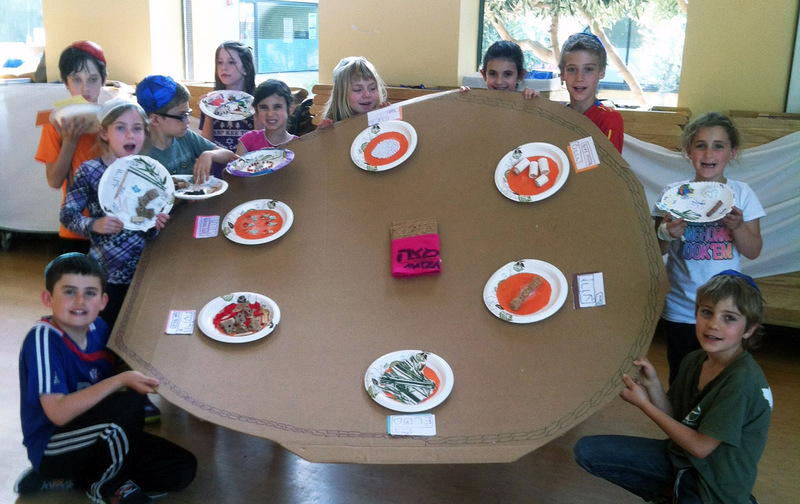 Is this Berkeley seder ‘plate’ the world’s largest?